I am a big fan of stir-fry since you can add any veggies you have on hand to a skillet, add a protein, a sauce and ‘wa-la’, you have a meal! Now, sure you can buy plenty of off-the-shelf peanut sauces, but I find that when I end up buying one, using it once and then I don’t get around to using it for a while. Months later find it in the depths of my fridge and end up tossing it – what a waste. I hate wasting food. So, I started making my own since I almost always have the ingredients on hand that I need to whip up my own simple peanut sauce and with way fewer additives and for a lot less money too! Plus, I can use high quality nut butter, or sub in almond butter if I need to keep it peanut free for allergy concerns. People always rave about this one and I can’t tell you how simple and healthy this is! Plus, if you happened to just make the crock pot roasted chicken, this is a great same-week meal to use up some of that chicken you have on hand. Sprinkle the chicken with garlic powder, sea salt & pepper to taste. After letting chicken rest a few minutes, slice chicken and set aside. Add the sliced carrots and cook 2-3 minutes. Cook the rice noodles for 4 minutes (or per package instructions). When all is cooked, add the chicken and chopped greens and sauté until greens are wilted. 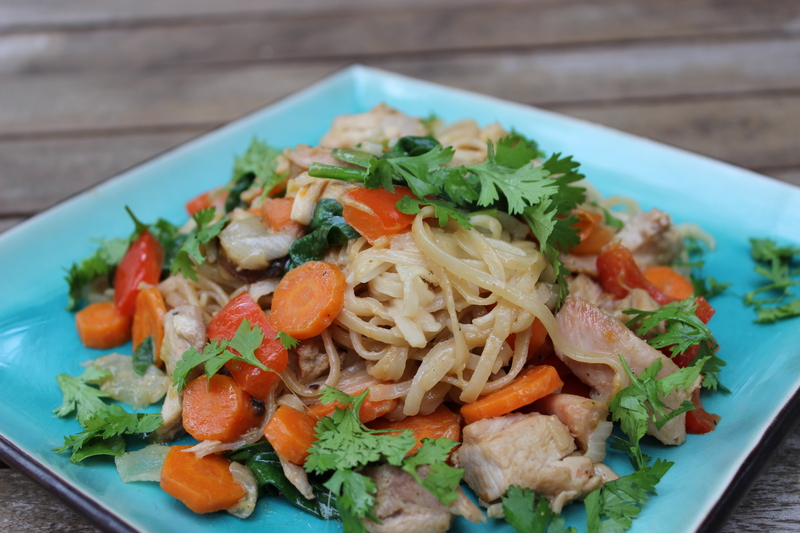 Add your cooked noodles to the wok with cooked veggies and chicken. NOTE: You could also throw this mixture over rice if you don’t have any noodles on hand. Pour the peanut sauce over the mixture in wok and toss all together. Add a little water if its too thick, or let it simmer for a couple of minutes on low to thicken it up to your liking.